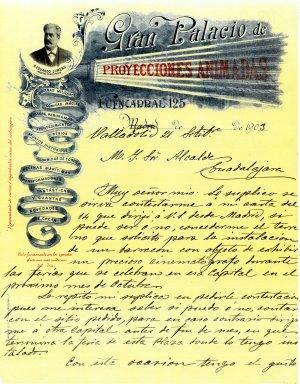 Eduardo Jimeno Peromarta’s letter, Spanish cinema pioneer and owner of the Great Palace of Animated Image, written in Valladolid the 21 September of 1903 and addressed to the Guadalajara mayor. Dear Sir, I beseech you to answer the letter I wrote you the 14 from Madrid concerning the site I’m requesting to install my barrack to show a precious cinematograph in the fair of your city next month. I repeat my plea for an answer, because I’m interested in knowing if I can or cannot use the requested site for, if the answer is negative, I will go to another city before the end of the month, when the fair where I’m installed ends … A.H.M.